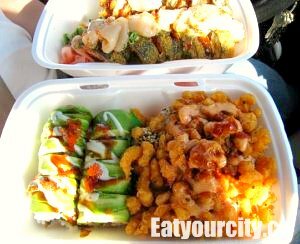 Eat Your City: El's Japanese Fusion Calgary - Best rolls in Calgary! El's Japanese Fusion Calgary - Best rolls in Calgary! Situated in the colorful area of Marda Loop, this little sushi roll shop has an unassuming storefront. Sandwiched between a Montreal deli and a diner, you can easily miss it if you're not looking for it in this revitalized and happening neighbourhood. Run by a Korean couple, they pride themselves on creating fresh and delicious variations on the humble sushi roll. 70 types of distinctly different rolls with a small sashimi and nigiri selection is available on their menu - impressive as the husband and wife team are the sole two that man the kitchen. Service is always prompt and polite, with a steady stream of customers waiting for take-out orders and the dining area is usually packed with customers digging in. The decor is minimalistic chic - dark wooden tables, funky lighting, and large dark counter - used to facilitate the take out orders. With the semi-open kitchen, you can catch glimpses of the chefs working their magic as tantalizing smells and the characteristic tang of seasoned sushi rice greet you at the door. Plating is done beautifully if you're dining in, as we didn't have a reservation and didn't feel like waiting, our orders were put into styrofoam take-out boxes. To the right is Popcorn maki - lightly battered crunchy spicy popcorn shrimp maki topped with a mini mountain of more spicy popcorn shrimp and topped with a drizzle of homemade dynamite sauce. The combination of both the popcorn shrimp and sauce leaves you blowing steam out of your ears, but its so good, you can't help but continue to eat until you gaze sadly at the empty platter. To the back is the Superstar maki - a tasty deep fried roll with perfectly cooked succulent soft shell crab, enveloped with a huge generous serving of sweet raw scallop sashimi tossed in a spicy dynamite sauce and garnished with cayanne pepper and flying fish roe.o the left is a delectable grilled unagi rolled in a trace of rice and layers of thinly sliced avocado drizzled with a sweet sauce mmmm! The eel is tender and melts in your mouth with a burst of flavor from the unagi glaze used when they grill the eel. Quibbles - usually excellent service, but not consistently so, thus the 8/10. While some of the rolls can get redundant as they tend to cycle through a small selection of ingredients inside the rolls, the toppings that range from sashimi to popcorn shrimp and the multitude of sauces keeps things interesting. The fusion aspect can be attributed to some interesting ingredients they incorporate into some of their rolls like cream cheese, and fun toppings like their addictively spicy popcorn shrimp. There's a roll with your name on it.. go with some friends so you can order a greater variety and have a goot eats!